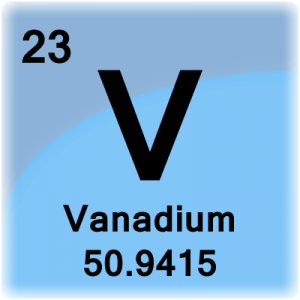 Vanadium is atomic number 23 on the periodic table, with element symbol V. It is a shiny, hard transition metal, historically used to make strong steel for car bodies. These vanadium facts contain chemical and physical data along with general information and history. Del Rio was a mineralogy professor at the Royal School of Mines in Mexico City when he discovered what he believed to be a new element in a lead containing ore. His original name for his discovery was panchromium because of the variety of colors the salts produced. He renamed the element to erythronium (Latin for red flower) since most of these salts turned red on heating. Del Rio shipped his samples to Paris for confirmation. In 1805, French chemist Hippolyte-Victor Collet-Sescotils published his findings about Del Rio’s lead ore. He said Del Rio’s element was just impure chromium, not a new element. Del Rio accepted this analysis and withdrew his claim. In 1830, Swedish chemist Nils Gabriel Sefström discovered a new element he named vanadium. German chemist Friedrich Wöhler showed Sefström’s vanadium was the same as Del Rio’s discovery. Name Origin: Vanadium is named after Vanadis, the Norse name of the Scandinavian goddess of beauty, Freyja. Natural scandium is comprised of one stable isotopes 51V and one nearly stable isotope, 50V. Twenty four artificial isotopes have been discovered ranging from 40 to 65. Vanadium-50 is a radioactive isotope containing 25 neutrons. Vanadium-50 decays 83% of the time into titanium-50 by β+ decay and 17% into chromium-50 by β– decay with a half-life of 1.44×1017 years. 0.25% of natural vanadium is vanadium-50. 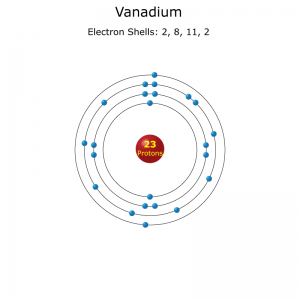 Vanadium-51 is the only stable isotope of vanadium and contains 26 neutrons. 99.75% of natural vanadium is vanadium-51. 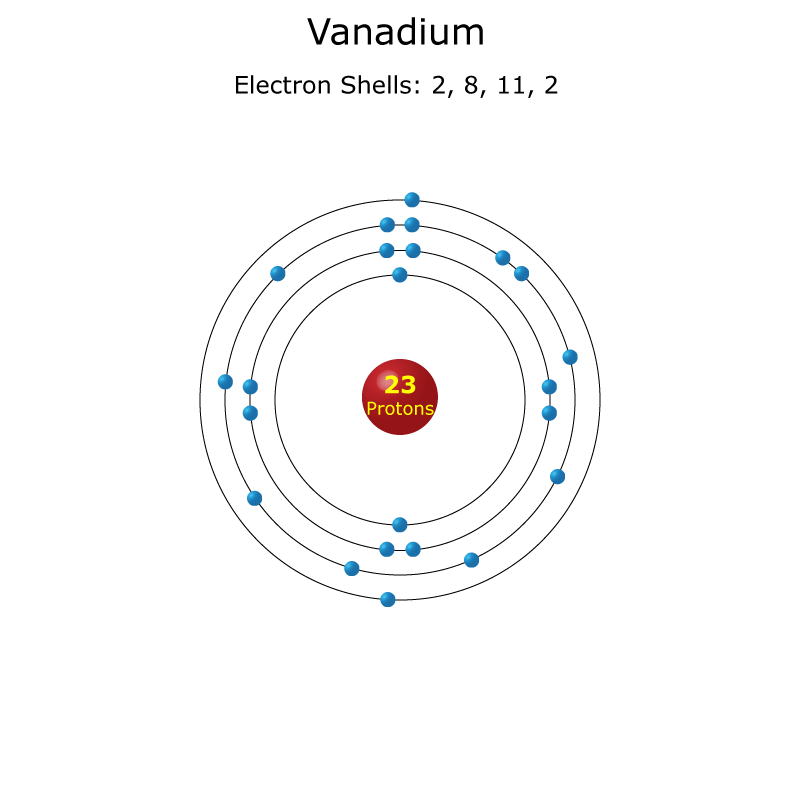 Electron shell configuration for vanadium. Aqueous solutions of +2, +3, +4 and +5 ions of vanadium. Vanadium is a medium hard, ductile, shiny, strong blue-gray metal at room temperature. 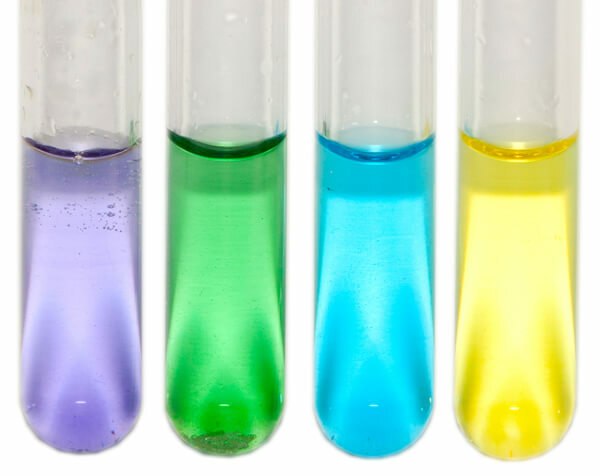 Vanadium was originally named panchromium because of the many different colors produced by the ions of different oxidation states. The photo shows the colors of the +2, +3, +4 and +5 oxidation states. Pure vanadium was not produced until 1869 when English chemist, Henry Roscoe showed previous samples of vanadium were actually vanadium nitride (VN). Most vanadium is used to strengthen steel. Vanadium-steel alloys are used in engine parts, armor plating, axles and tools. Vanadium was first used extensively in the automobile industry to build the Model T Ford. Early Model T advertisements claimed vanadium steel was the toughest and most enduring steel ever manufactured and used throughout the frame of the car. Vanadium is found in 65 different minerals. Vanadium is used in nuclear reactors because of its low neutron absorbing properties. Vanadium pentoxide (V2O5) is used as a catalyst in the production of sulfuric acid. Vanadium is found in the blood cells of some marine life. These proteins are known as vanabins. Vanadium is an essential nutrient in very small doses, but vanadium compounds are mostly considered toxic to humans. Learn more about elements on the periodic table. 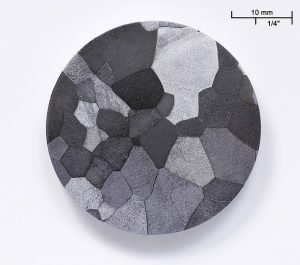 There is a tendency for vanadium containing steels to be brittle when reheated as in weldingI am looking for data on this as found in 1.4509 catalytic steel. Cheers Mike Wiggins.